Face peels are intended to remove our skins outermost layer of dead skin cells. It's been a dilemma for me at first to use intense facial peeling products when I saw friends having their DIY Face Peel. Yes I can do exfoliating, but to think how would I look like during the peeling? Scared. With the help of these kinds of products, it might be more convenient and affordable than visiting spas or facial centers that will help you achieve a clearer, brighter skin. We can also choose facial centers to have it done professionally - I just skip this part. I never knew I'll be doing it for myself as well. I checked feedback of several skin peeling sets available locally and my cousin Jane and Apol (my enablers!) recommend me this set from Revitaglow. This is also one of the reason why I can't blog lately or post a lot on IG, I'm trying this set alone. Dead skin and gives you pinkish glow. Clears black heads and white heads. 2nd day 5 pimples appeared (chin area) - I panicked some looks like cystic acne and asked my cousin about this since its not normal for me for just an overnight use of a product. Jane told me it happened the same when she first used the product. This is the hardest part of using this set when it already started flaking then peeling goes after. It stopped rubbing the toner, applied using a tapping motion with my cotton pad. 4th day My face looks red as well and a bit darker like I just came from a beach swimming. I think this is because of the peeling. 5th day No more pimples but leaves dark pimple marks, peeling still continue. toner application feels like sting burn effect. I toned at evening since I'm at home and can take the burning feeling. Skin feels so tight that I can only smile a little. 7th day I still feel the sting burn effect but now minimal compared to my 5th day. My face looks flush but close to my face color after biking. 10th day Hello to a more flawless skin! I stopped using the set after 10 days. I'm currently contented with the result. What surprised me here is my syringoma on my eye area looks less visible than before. If you're reading my blog last year, you might encounter how I tried to remove it with an aesthetics center (Syringoma Electrocautery). I should have avoided my lip area. It caused tight skin and made too long to recover skin renewal. PS: I'm writing this post more than a week after my 10day usage of Revitaglow Revitalizing Set to see and note changes. Now my Syringomas are less visible and almost flat. However, it's somehow looks like lighter than my actual face color. Cheek pimple marks are still there when I stopped on my 10th day. (I shouldn't pricked them!) I skip my face makeup and used only for eyebrows and lips during this period. I even wear face mask cover when I'm going out of the house to avoid direct sun heat. I mentioned before that toner caused that sting burn effect, but I love the creams included in this set. It helps to lessen the sting effect and relax my tight skin. Skin now felt smoother and my skin texture improved after use. I recommend not to prick pimples during the process so it will not leave dark pimple marks. Overall it improved my skin and pores. I'm not sure if I can recommend it to my readers due to different skin types, but feel free to try. You might be surprised with the Sting Feel and the peeling. Peeling it quite scary at first. Make sure to skin test first. 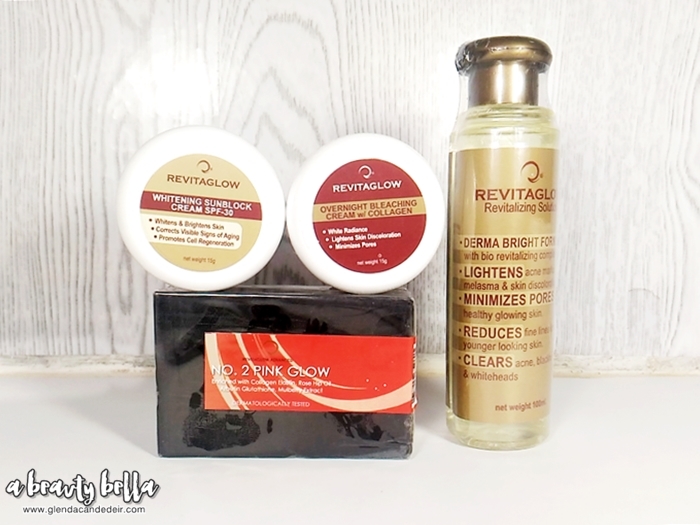 5 comments on "Revitaglow Skin Care Revitalizing Set Review"
how's your skin right now? i mean bumalik ba sya sa dati? Hi, after using the product(which was your tenth day) I assume na dry/nagpepeel parin yung skin mo, nag apply ka ba ng mosturizer or hinintay mo nalang matapos po yung pag pepeel ? Hello, do you still use the set and what are the other products that you used after the set? ^^ Thanks!